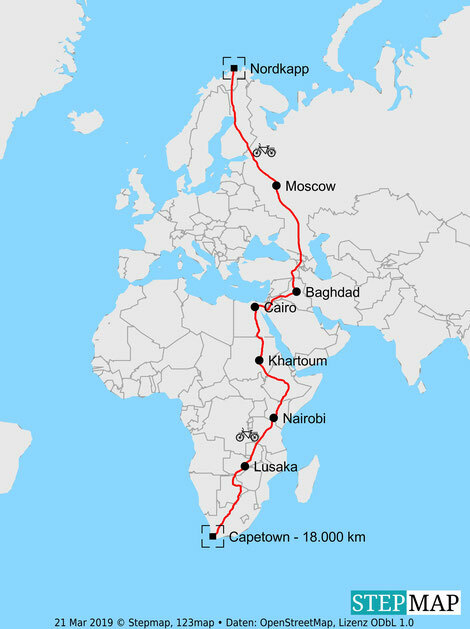 In August 2019, I will set off at Cape North in Norway to cycle 18.000 km to Capetown at the Southern end of Africa. I will cycle together with Mexican adventurer Charly Meza and we will ride completely unsupported, pushing to arrive in less than 75 days. While we will be racing to break the record, we also want to have a great adventure and explore the scenery that our route offers. After a start in the Arctic and the endless motorways of Russia, the Middle East will be a foremost logistical challenge. Halfway through the ride, the real highlight starts: Africa, a continent where already the name can leave you dreaming of adventures. The current World Record stands at 102 days, a time we will beat by a month. Life tracker, diary and constant updates are coming soon.